This week two programs already were changed to “NOT PAYING” status. Some might say it’s not a surprise. However, we all know that from time to time there are programs that satisfy investors for a few months. Even though there might be some patterns, we can’t predict the future of any program being monitored and it’s totally up to each one of us where and when to invest. As usual, a few HYIP’s turn into scam and a few new ones join the game. Today my first review is a program called Crypteiro, which has a Telegram-bot based investor panel. It joined Golden Stage on DavidNews.com monitor 8 days ago an has been online in total for 14 days. I have now reinvested in this program $400 and will keep you updated with the payment status, which on the 6th of February is “PAYING”. I have already opened the website of Crypteiro and must say the first impression of this program is very good. However, let’s take a better look at this program and find out more about it! 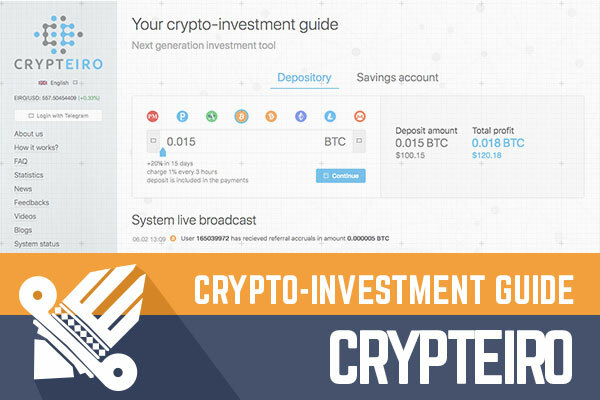 Crypteiro is offering two investment plans – “Depository” with 20% net revenue within 15 days and “Savings account” with 5-15% net revenue per month. Minimum deposit of both investment plans is $50 and minimum withdrawal is $1. Accruals are available every 3 hours in the “Depository” plan, but every hour in the “Savings account” plan. You can already see that the first plan is more beneficial because deposit can generate 20% net revenue per 15 days while the second only 2,5-7,5%. Probably admin is trying to diversify the cash flow here. Due to unpredictable nature of HYIP’s the first plan has a higher chance of attracting potential investors. Minimum deposit and withdrawals are similar for both investment plans and the initial deposit is included in the payments. On Crypteiro “About Us” page we can read the whole story of this program. One thing is clear to me that by investing in Crypteiro we “get the share of profit”. Everything else is written using codenames and abstract technological terms. Admin has come up with a unique cryptocurrency called EIRO, which I couldn’t find online. Some sort of neural networks regulates the cost of this currency. Feel free to do some extra reading if you are interested. In other words, Crypteiro is a crypto-currency inspired program and it has UK company registration certificate. The website is very simple but looks professional. There are 10 language options available but only 9 of them are active. Feel free to check if translations are bot translated. As I said, the website gives a good impression. First, I would say that designer has chosen a good combination of colors. Second, right after opening the homepage we can information about investment plans. Third, real-time statistics gives the impression that program is very active. In fact, there is much going in the real-time feed. Yes, we should be skeptical about stats, but the deposited and withdrawn amounts I have seen so far from this feed look realistic if compared to feeds I see on other websites, which don’t change and show only large deposits. Crypterio has been active on social media since the 16th of January. In total 27 likes on the FB community page without many reactions on posts. However, community page looks realistic for 2 weeks old program. Twitter – 9 followers, Vkontakte – 170. In fact, Vkontakte profile is very active and has more posts than previous two. This might be an explanation of the higher total amount of visitors. I did also check what’s going on in the HYIP community forums and I see mainly information about deposits and withdrawals. Sure, this impression might also be the result of marketing activities. In case you are not familiar with telegram-bot type investor panels, I can say they are very simple. In fact, I prefer them over some custom-made panels. Custom-made panels are often very functional and interactive but most of them are hard to navigate. In fact, some of them seem to be built to confuse us and make it hard to understand how to make withdrawals. Of course, there are no problems with deposits and they are always on the first dashboard, but withdrawals… As I said, Crypteiro telegram bot is very simple and it actually tells you what to do in case of adding deposit or withdrawing money. Just follow the instructions and enter the information bot requests. So far no problems with bot or withdrawals. I already gave you insight into investment plans. Crypteiro is offering one simple investment plan with 20% net profit within 15 days. It’s a short-term investment with accruals available every 3 hours. Initial deposit is included in the payments. Minimum deposit in Crypteiro is $50 and minimum withdrawal $1. So, at first glance, it might be confusing to read 1% every 3 hours and 20% revenue in 15 days. 20% is net revenue, but 1% includes both initial deposit and the profit. $200 investment in this plan would reach its break-even point after 13 days. The last two days is when deposit makes the actual 20% profit. To sum it up for you the net profit of the first plan is 1,33% a day, which puts this program into short-term deposit category with low rates. However, I assume such rate looks realistic at least for a few investment cycles. In fact, the first investment cycle will complete tomorrow. Currently, the website, the overall marketing approach, telegram bot and other features look smooth but we don’t know what will happen tomorrow with this or any other program on DavidNews.com monitor. Therefore, if you ever decide to make any investments, don’t invest more than you can afford to lose! Have you already made an investment in Crypteiro and have any useful information to share with us? Please drop a message in the chat box to share your experience! Investment plans: 1% every 3 hours for 15 days, initial deposit included in the payments. Invest in Ethereum on eToro the World's #1 Social Trading Network.